Bhasha Official Blog: Introducing Bhasha SETT - The only Sinhala/Tamil enabled Android web browser! Introducing Bhasha SETT - The only Sinhala/Tamil enabled Android web browser! Bhasha SETT Browser is the only Sinhala/Tamil enabled mobile web browser for Android. Even though Android doesn't support Sinhala or Tamil Unicode or rendering by default, Android users can conveniently read any Sinhala/Tamil website or web content using SETT Browser with full Unicode rendering support. No need to root the device or install fonts manually at all. In addition to Sinhala/Tamil native script rendering support, it also can render Sinhala/Tamil contents in Latin script, enabling Tamils who understand Sinhala, but can't read Sinhala script to read & get knowledge of Sinhala contents & vice-versa. Bhasha SETT Browser is basically a mobile web browser for Android which has the capability of rendering & displaying Sinhala/Tamil Unicode web content in a human readable way. Since Android doesn't support complex script rendering, Sinhala/Tamil users are currently unable to read their local language web content with the Android legacy browser. SETT Browser doesn't depend on the rendering capability of the Android platform since it has its own complex script rendering engine & therefore the users can just install this app & use it to read their local language web content. Bhasha SETT Browser provides two different rendering methods to view Sinhala/Tamil web contents. They are Native Script rendering & Latin Script transliterated rendering. Native Script rendering is supported in Android 2.2 & above versions & Latin Script transliterated rendering is supported in Android 2.0.1 & above versions. With Latin script rendering method, the users who have only the understanding literacy, but not the reading literacy of Sinhala & Tamil languages are also able to read Sinhala/Tamil web contents. For example, majority of Sri Lankan Tamils can speak Sinhala, but they cannot read & write Sinhala. Therefore they cannot refer any Sinhala content on the Internet even when they already have the understanding ability of Sinhala. SETT Browser ialso provides a solution for that & with Latin script rendering they can read Sinhala contend in Latin (English) characters. Sinhalese & Tamil users cannot read Sinhala/Tamil web contents using their Android mobile phones, since the Android OS doesn't support Sinhala/Tamil languages or complex script rendering. 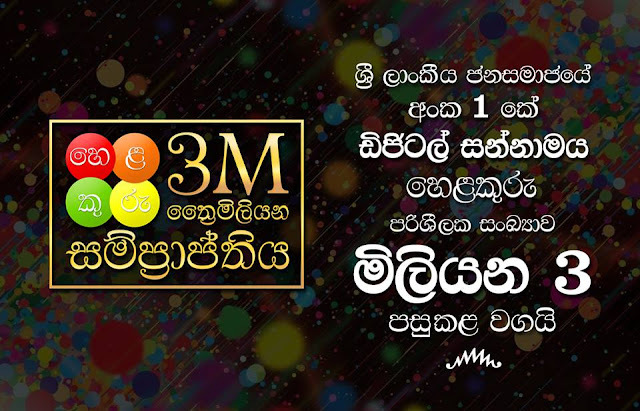 Therefore the requirement was finding a solution for this issue & implementing a way to read Sinhala/Tamil web contents in Android mobile phones. This issue had not been completely solved before. That is, there were no mobile web browsers for Android which fully supports Sinhala/Tamil rendering. Bhasha SETT Browser is basically a mobile web browser. Therefore it does have the general features of a web browser like bookmarks, history, downloads & tabs. In addition to that, the most important & the unique feature of SETT Browser is its exclusive capability of rendering & displaying Sinhala/Tamil Unicode web contents. Rendering of Sinhala/Tamil Unicode contents is done in two ways depending on the Android version or the user preference. Bhasha SETT Browser renders the Sinhala/Tamil Unicode web contents in their own native scripts in Android versions 2.2 & above. Users just have to install this SETT Browser app & the Sinhala/Tamil Native Script rendering is enabled in the browser by default. Bhasha SETT Browser can also render the Sinhala/Tamil Unicode contents in transliterated Latin Script (i.e. in English letters) in Android versions 2.0.1 & above. Bhasha SETT Browser can render Sinhala, English & Tamil Unicode contents simultaneously. Therefore the users are able to read the text in three languages even they are in the same web page or even in the same html tag. This capability has been acheived by using a specially made trilingual Unicode font & a special algorithm. 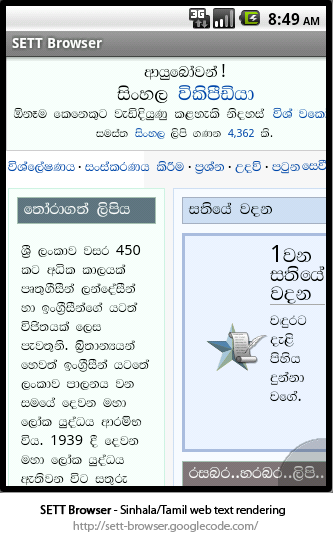 Capability of reading Sinhala/Tamil web contents in their Native scripts on Android mobile phones. Capability of reading Sinhala/Tamil contents in transliterated Latin script addressing the script reading literacy issue. Full complex script rendering support for Sinhala & Tamil with no rendering errors at all. Simultaneous rendering of Sinhala, English & Tamil. No need to root the phone or install fonts manually & therefore no technical knowledge is required. No modification is made to the style sheets of webpages. No extra bandwidth is used since the rendering is done inside the browser. Bhasha SETT Browser is a Sinhala/Tamil enabled mobile web browser for Android. The requirement was to develop a solution for the issue of not having a method to read Sinhala/Tamil web contents in Android mobile phones. Therefore the requirement of this project is successfully achieved. Bhasha SETT Browser will expand its language support for all other languages which Android currently doesn't support in the near future. Bhasha wins mBillionth South Asian Award 2011! "Empowering the Masses" - Bhasha launches!